Fazlollah Zahedi (Persian: فضل‌الله زاهدی‎, translit. Fazlollāh Zāhedi, pronounced [fæzloɫˈɫɒːh zɒːheˈdiː]; c. 1892 – 2 September 1963) was an Iranian general and statesman who replaced the democratically elected Iranian Prime Minister Mohammad Mosaddegh through a coup d'état, in which he played a major role. Born in Hamedan in 1892, Fazlollah Zahedi was the son of Abol Hassan "Bassir Diwan" Zahedi, a wealthy land owner at the city of Hamedan. During his service at the Imperial Russian-trained Iranian Cossack Brigade, one of his military superiors was Reza Khan, who later became the Iranian monarch. Zahedi was among the officers dispatched to Gilan to put an end to the Jangal movement of Mirza Kuchak Khan. At the age of 23, as a company commander, Zahedi led troops into battle against rebel tribesmen in the northern provinces. Two years later Reza Shah promoted him to the rank of brigadier general. During Reza Shah's reign, General Zahedi was named (1926) military governor of Khuzestan province, his first important government position, and in 1932 chief of national police, one of the nation's top internal posts. During World War II he was appointed (1941) commanding general of the Isfahan Division. Following the forced abdication of Reza Shah in 1941, the British came to believe that Zahedi was planning a general uprising in cooperation with German forces, and as one of the worst grain-hoarders, was responsible for widespread popular discontent. He was arrested in his own office by Fitzroy Maclean, who details the adventure in his 1949 memoir Eastern Approaches. Zahedi was flown out of the country and interned in Palestine. After retiring from the army, he was named Senator in 1950. Zahedi was appointed Minister of the Interior (1951) in Hossein Ala''s administration, a post he would retain when Dr. Mohammad Mossadegh became Prime Minister. Zahedi actively supported the new government's nationalisation of the oil industry, which had previously been owned by the Anglo-Iranian Oil Company, now BP. However, he was at odds with Mossadegh over his increasing tolerance for the outlawed communist party Tudeh, which had boldly demonstrated in favor of nationalisation. Both of these moves antagonised the Western Powers, especially the United Kingdom and the United States. Zahedi was dismissed by Prime Minister Mossadegh after a bloody crackdown on pro-nationalization protesters in mid-1951 in which 20 people were killed and 2000 wounded. Zahedi finally broke with Mossadegh, with the latter accusing him of fostering plans for a coup. Meanwhile, sanctions levied by the Western Powers significantly curtailed Iranian oil exports, leading to an economic crisis. Disorder among several ethnic groups in southern Iran and labor unrest among oil-field workers put further pressures on the government. At the behest of the British and American governments, the Iranian military carried out a coup d'état which put an end to Mossadeq's rule and the era of constitutional monarchy and replaced it by direct rule of the Shah. The newly formed CIA, along with the British intelligence agency MI6, took an active role in the developments, terming their involvement Operation Ajax. Zahedi and his followers, financed by the foreign intelligence services, planted newspaper articles in Iranian publications and paid agent provocateurs to start riots. There were such riots in Tehran and other cities. Fearing his arrest, Zahedi went into hiding. On 15 August, after the first attempted coup d'état failed, the Shah fled first to Baghdad and then to Rome, Italy, after signing two decrees, one dismissing Mossadegh and the other naming Zahedi to replace him as Prime Minister. Both decrees were in accordance with clause 46 of the Iranian constitution, which stated that the Shah had the power to appoint all Ministers. Backed by the United Kingdom and the United States, and encouraged by the intelligence agents Kermit Roosevelt Jr and Donald Wilber, Zahedi staged a second coup on 19 August 1953. Military units arrested Mossadeq at his home at night. The Shah returned from exile on 22 August 1953. General Zahedi's role as Iran's Prime Minister ended in 1955. His final post was Ambassador to the United Nations, in Geneva, where he died in 1963. Zahedi was a descendant of the Sufi mystics Sheikh Zahed Gilani and Sheikh Safi-ad-din Ardabili, the eponym of the Safavid Dynasty, and through his mother, Djavaher Khanom, he traced his descent to the dynastic ruler Karim Khan Zand. Zahedi married Khadijeh Pirnia, daughter of Hossein Pirnia (titled Motamen-ol-Molk), and granddaughter to Mozzafar-al-Din Shah Qajar (1853–1907). They had a son, Ardeshir, and a daughter, Homa. 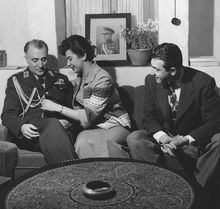 His son Ardeshir became a politician and diplomat and married Princess Shahnaz Pahlavi, the daughter of Mohammad Reza Pahlavi from his first marriage to Princess Fawzia of Egypt, daughter of King Fuad I. His daughter Homa Zahedi was a member of Parliament, representing the constituency of the region of Hamadan. According to The New York Times report a day after the 1953 coup, "General Zahedi has been married twice, but it is not known here whether his second wife is living. By his second wife he had two sons, one of whom lives in Sydney, Australia, while the second son, an air force officer, was killed in a crash." ^ a b Maclean, Fitzroy. Eastern Approaches. 1949. Jonathan Cape, London. No ISBN. ^ O′Sullivan, Adrian (2015). Espionage and Counterintelligence in Occupied Persia (Iran): The Success of the Allied Secret Services, 1941-45. Palgrave Macmillan. pp. 120–131. ISBN 978-1-137-55556-4. ^ Louis, Wm. Roger (2007). Ends of British Imperialism: The Scramble for Empire, Suez, and Decolonization. I. B. Tauris. p. 776. ISBN 978-1-84511-347-6. ^ "Royalists Oust Mossadegh; Army Seizes Helm". The New York Times. Wikimedia Commons has media related to Fazlollah Zahedi. Secrets of History: The C.I.A. in Iran -- A special report. ; How a Plot Convulsed Iran in '53 (and in '79). The New York Times, 16 April 2000. This page was last edited on 29 November 2018, at 17:24 (UTC).